Are you mad for plaid? I am! Plaid has always been one of my favorite prints. There's just something about it that draws me in. Not sure if it's the color combination or the fact that is just looks cool! 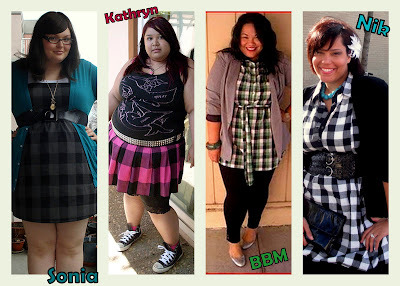 I know many would say big girls should not wear plaid, I say if you love it wear it. Gone are the days where plaid was reserved for school uniforms, kilts and the grunge look! I think today's plaid patterns are very modern and can look stylish and chic. Plaid is just a fun print, and I think we will be seeing it for many years to come. I got some lovely models to show just how fun, cute and stylish plaid prints can be. Take a look at some adorable outfits by my friends. Sonia from Anomalous Allure a wearing plaid dress from Jean Queen. She accidentally walked into a store, and was pleasantly surprised to find cute plus size clothes and great service. Now that's my kind of shopping! Love great customer service. Kathryn from Fat-tastic Fashion is wearing a plaid skirt from dd's discount. She calls it her rock n roll plaid look, with the studded belt and chucks she's ready to rock out. Still keeping it girly with the pink plaid and lace bike shorts. Even when she's tough she still likes to be feminine. BBM from Big Beautyful Mess is wearing gingham plaid tunic from B&Lu. Feeling discouraged not finding perfect plaid top. She cleverly email her favorite online retailer (B&Lu). A few months later her email wish was answered, B&Lu had the perfect plaid tunic. I think secretly B&Lu made it especially for BBM, she looks fabulous in her plaid! Nik from xoxoNikStar wearing plaid dress from fellow bloggers shop. She wore the plaid dress to spend the day with her mom. Mother & daughter time is always special, so Nik wanted to look the part. Like mother like daughter they both looked beautiful, go check out her pics with her momma! Thanks ladies for all the great plaid outfits. Each week I get to share all these fabulous bloggers wearing the latest and best trends. Who ever said big girls aren't fashionable obviously doesn't have a clue. Go check out all my friends blogs to see even more stylish outfits. If you love this feature and want to share your trends, send me your pics. Helps me out when you volunteer! Future trends: animal prints, send me your pics to cidstylefile@gmail.com. I've always been a lover of plaid! Yay!!! I'm mad for plaid :) I think I just found two more bloggers to check out. This trend is great, and all the girls look fierce in their outfits! Love it! :D I really like this Trends & friends thing. awesome! thanks so much cid ... ure like, my fave. and i just found 2 new cute bloggers! woo-hoo!